Have you ever dreamt of a private villa on the water? This might become reality when you step aboard one of the three Chobe Princesses. With no set itinerary and only a small number of guests per boat, staying here feels like being on your own houseboat – and a very well appointed one, that is. Book the entire boat for your family or group of friends and relax during this intimate river safari. 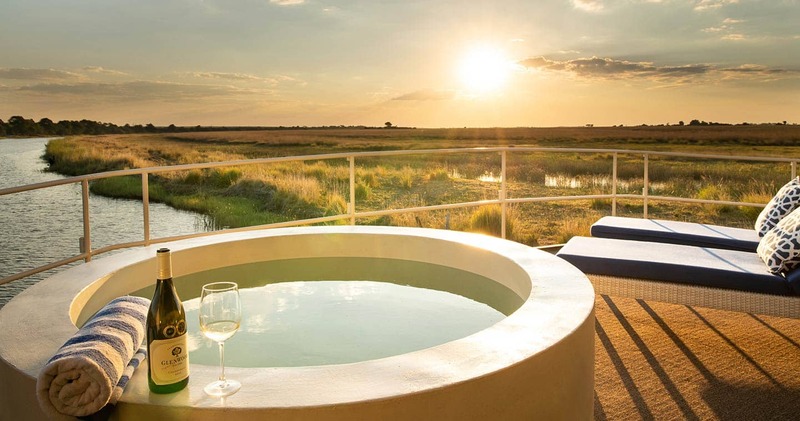 Open your curtains to sensational sunrises, feast on amazing meals while enjoying a 360° Botswana view and slip into the slow rhythm of the river. The crew will pamper you with unaffected warmth and generosity, doing whatever they can to make this trip memorable. And as if their hospitality alone isn’t something to remember, the wildlife viewing will definitely remain in your memories for a lifetime. 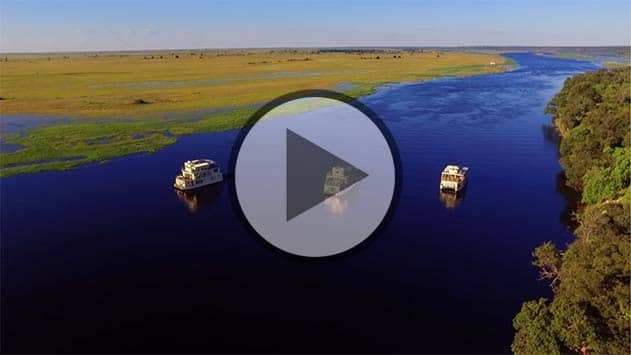 As you drift down the Chobe River, you will be exposed to incredible game viewing from several mooring points along the Chobe and Zambezi Rivers. 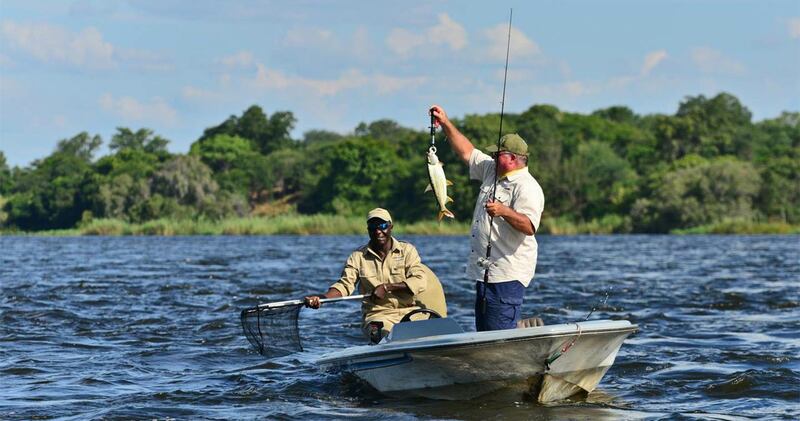 Hop on the smaller tender boats and view wildlife from the water: a completely different experience from a game drive, as animals are more relaxed and at ease. 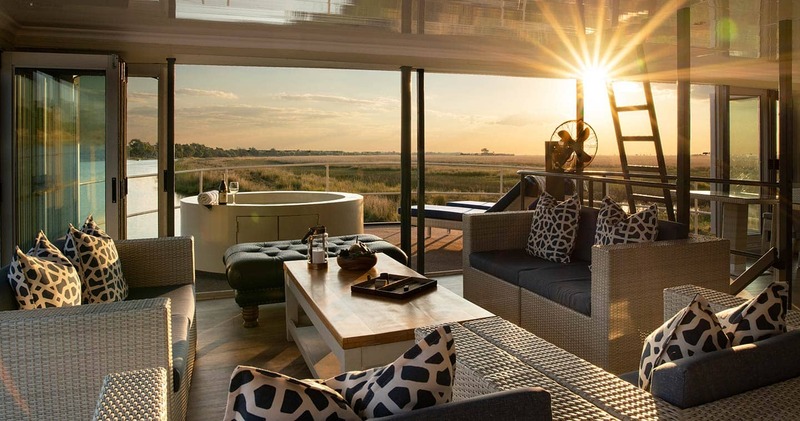 The Pride of the Zambezi accommodates passengers in five elegant en-suite cabins located on the lower deck and one en-suite cabin on the top deck. Each cabin can be made up as a twin or double, with fans, mosquito gauze and built-in cupboards. Wake up to be perfectly positioned for game viewing from the comfort of your own room. Elephants taking a dust bed, hippos going for their morning swim: you will sit front row. Tastefully and contemporary decorated, the rooms are deeply calming and feel deliciously remote. When your mind is at ease and disconnected from our fast Western world, it is time to discover the main areas of the boat. The middle deck is the heart of the boat with a fully equipped bar, comfortable lounge and dining area. This deck offers complete protection from the elements if needed, as well as a flat screen television and a plunge pool. The top deck features sun loungers (a great place to spot wildlife while sipping a cold drink). All areas boast incredible views while the boat cruises down the river. 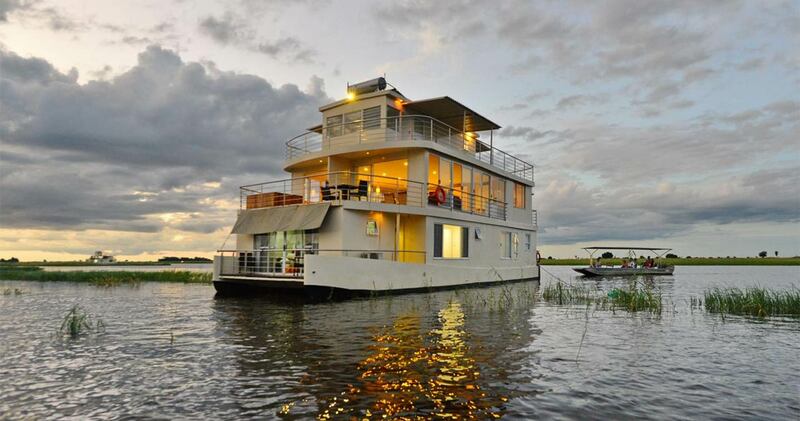 Staying on board of a Chobe Princess means that you are the captain of your river safari cruise. No tight schedules, no noisy engines, just the tranquillity of the ancient river. 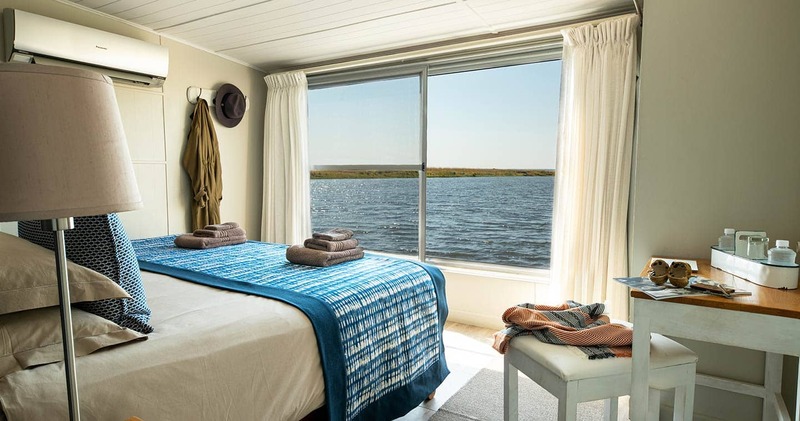 While sailing the Chobe River, the houseboat its top deck provides an ideal platform from which to view Chobe National Park’s abundant wildlife. In addition, each houseboat has a minimum of three smaller tender boats for use on a number of daily excursions that may take your fancy: gaze at four meter long crocodiles, laying still as tree trunks, witness a spectacular hippo fight, or mark off over 500 bird species found in this wetland paradise. After watching some of the magnificent wildlife, you can try your hand at landing a tiger fish, or capture Africa's unique beauty on a photographic safari. For those seeking more physical activity: go on a village walk or guided walk safari, as you will soon discover the mindfulness of walking on African soil. As mentioned earlier: your itinerary is a personal affair. Whenever you feel like lazing on a deck chair with a good read, grab that opportunity. It is all about finding your own flow. Having come from Kruger Park, I wasn't sure if I could top the experience - but I was wrong! We got so close to the crocodiles and hippos, and saw separate groups of elephants crossing the river. Such an amazing experience. Don't miss out on doing this. The boat cruises are an excellent way to view animals up close as they take you to where the animals are. Elephants, crocodiles and buffalo were just a few of the animals we were able to get close to. The sunset on the Chobe River at the end of the cruise was just spectacular. 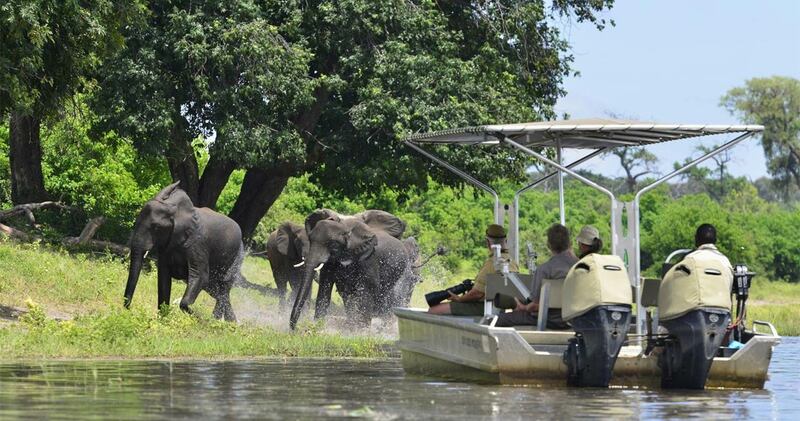 The boat cruise is definitely a must for every visitor to Chobe National Park. On board of the Chobe Princess, you will see countless elephants, whose resident population is estimated to be over 140,000. Rates are per person sharing. Please note: Indicated price is for a '2 night Chobe River cruise', rates for 3 night river cruises are displayed below. Departure days for 2 night cruises are on Monday and Wednesday; 3 night cruises depart on Friday. Read all about travelling to the Chobe Princess on our getting to Chobe page. We hope you have found all information needed to decide that Chobe Princess in Chobe National Park is the perfect place for your next travel adventure. Please fill in the contact form and we will get back to you soon!